THE FORMER SECRETARY General of the United Nations Kofi Annan has died. 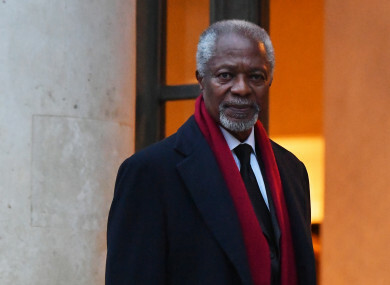 Annan, who led the UN from 1997 to 2006, was awarded the Nobel Peace Prize in 2001. He was the first black African secretary of the organisation. The Ghanaian diplomat died in hospital in Bern, Switzerland, in the early hours of this morning, Reuters reports. He was 80 years old. His foundation announced his death in a tweet, saying that he died after a short unspecified illness. “It is with immense sadness that the Annan family and the Kofi Annan Foundation announce that Kofi Annan, former Secretary General of the United Nations and Nobel Peace Laureate, passed away peacefully on Saturday 18th August after a short illness,” the Kofi Annan Foundation said. Current UN chief Antonio Guterres voiced deep sorrow at the news, calling his predecessor “a guiding force for good”. “Kofi Annan was a guiding force for good,” Guterres said in a statement shortly after the news broke. In many ways, Kofi Annan was the United Nations. He rose through the ranks to lead the organisation into the new millennium with matchless dignity and determination. President Michael D Higgins said Annan left “an indelible legacy on the global community”. “He was a voice constantly reminding us of the importance of protecting the instruments for multilateral action, and of urgent action to tackle climate change and to assist those vulnerable communities who are experiencing its effects most acutely. The Minister for Foreign Affairs, Simon Coveney, also paid tribute to Annan, describing him as a “dear friend to Ireland”. “Kofi Annan was a dear friend of Ireland and continuously demonstrated strong support for our own peace process and in particular the Good Friday Agreement, which was signed during his leadership of the UN,” he said. Annan is survived by his wife, Nane, and their children Ama, Kojo and Nina, who were by his side when he died. Email “Former UN Secretary General Kofi Annan has died following a short illness”. Feedback on “Former UN Secretary General Kofi Annan has died following a short illness”.